Suite 209 is a second floor suite with a breathtaking view of Lake Charlevoix. 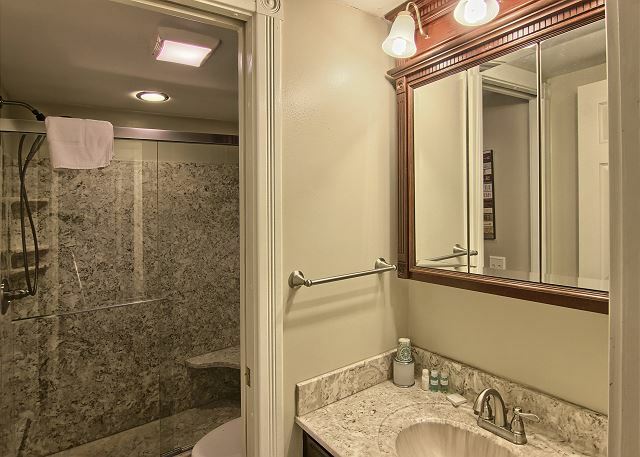 This unit offers one bedroom with a king size bed and one bathroom with a new large walk in shower. Suite 209 has a kitchenette equipped with dishes and utensils ready for in-suite meals, a dining table, and living room featuring a queen size sofa sleeper, gas-log fireplace, and flat screen TV. The sliding glass door opens to a private balcony that overlooks our private beach. Great location. Close to Boyne Mountain, which was the purpose of our trip. Great condo. Easy access. Whomever was staying above us was abit loud Saturday night. They were playing music extremely loud at 1 in the morning, but other than the overall experience was great. This was so pretty! The home was warm and comfortable. If I have the change I will stay here again. Thank you for a wonderful experience. The condo was beautiful and the location perfect. It was spotless. It was so nice to return to such a comfortable condo after being out all day. Cozy and warm. I will highly recommend this to family and friends. Excellent. The rental was exactly as portrayed on the web site. No surprises, great view, great location. Beautiful 3 days up North. Rental unit had a lot of little extras to make the stay more enjoyable. Surprised to find the pullout had a thick comfortable mattress. Would definitely recommend this unit and would love to come stay again! Wonderful Room for a FAMILY! I loved everything about this room! I have 2 children (2 and 6 years old) and they absolutely loved the room as well! I was "iffy" about there only being a shower... But after long days at the beach with the kids... Having JUST a shower with a detachable shower head was AMAZING! I loved the décor and how fresh and airy the room was. I also loved that there wasn't carpet by the front door (again with the sand and kids)! There were even kids sets of plates, forks and knifes... I loved all of the updated appliances as well!! I loved that there was an OVEN! I will definitely be asking for this room again. THANK YOU for making my stay here so wonderful. 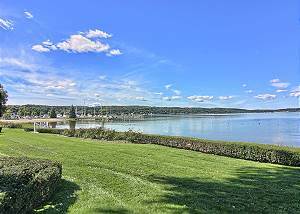 Perfect location with beautiful lake views and easy access to shops and restaurants. This condo was very clean and well maintained with a nice decor. Staff were very friendly and helpful throughout stay. Great view and very comfortable stay! Perfect! The location is really the big play here but it was so cozy and just what we needed for our weekend. Thank you and hope to stay again! We really loved staying here. The beautiful view from the condo. Everything very well kept up and clean. Especially loved that you were able to walk to the shops and such. Have an ice cream after dinner and go for a walk. A ten all the way! Would definitely stay here again. Beautifully appointed and fit our needs perfectly. Due to medical dietary restrictions we needed to prepare our meals rather than eat in restaurants. The kitchen was well equipped and served us well. The location was great and within easy walking distance of stores and shops, etc. We would definitely stay here again. The reservation process, email confirmation and rental information was very helpful. Check-in was seamless and the accommodations were immaculate. 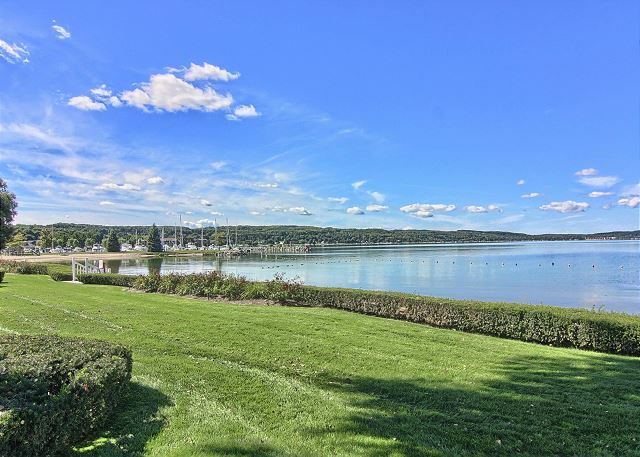 The Boyne City venue is picturesque, overlooking Lake Charlevoix. 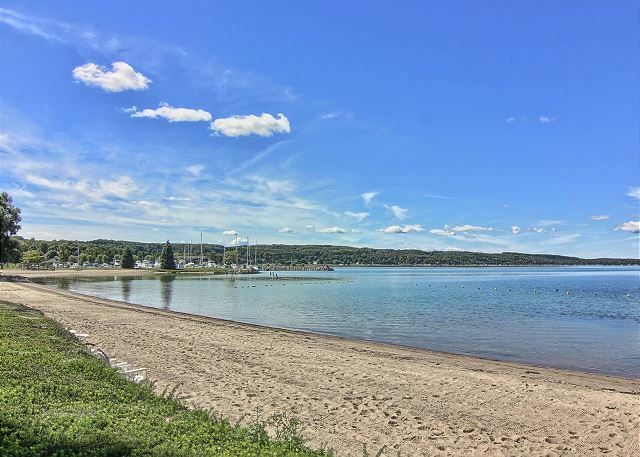 All within a stones throw are Boyne City park on the shore of Lake Charlevoix with a sandy public swimming beach and grassy areas. Shops, dining and libations are all within a short leisurely stroll. A very nicely stocked grocery, Family Fare is within easy walking distance. The Red Mesa grill on Water St. serves exceptional food and specializes in Margaritas. We stay here several times a year and wish we could own one of the units! Review by Alan Stanley W.
Decided on Boyne City because rates for condo were better than a hotel in Traverse City. Made our trip "up the coast" between TC and BC. Townline Cider Mill was amazing. 7 Monks Tap Room was a pleasant surprise. Hit the casino on our way up to Cafe Santa was amazing. Just a nice, relaxing visit to the area. We spent a short weekend in Boyne and this was a perfect place to stay and what a quaint hospital town. Nancy & Jim in B.C. Very nice. The room was great. Weather was clear all three days. Perfect sunsets. Sunsets alone are worth the price of admission! This rental is top notch. Be back soon. My husband and I really enjoyed our stay at 209 Water Street Inn. Our room was very comfortable and provided us with all that we needed for a very relaxing stay. The location to downtown Boyne City was great as well. Karen, Thanks for giving us this feedback, we really do appreciate hearing from our guests. All condos are individually owned, and I'm sure the owner will be happy to know you were happy with your stay, and felt the condo was equipped with what you needed for a great stay. My wife and I have been retired for a short time and we have been looking around Michigan for a location that we would like to spend the summer months. Upon arrival at the Water Street Inn we liked the location, on the water and the town walking minutes away! The weather was not what we were expecting, cool, windy and mid 60's, believe it or not, it was a blessing! Had it been in the 80's we would not have just stayed in the unit and enjoyed the view, looked at the information that was provided for us in the unit about the location and activities, read the remarks from past renters, and just sat and enjoyed each others company and talk about what this area has to offer, we would not have enjoyed what the Water Street Inn has to offer in a comfortable and well equipped unit. We had a great time in Boyne City. The room was very clean and inviting. The views of Lake Charlevoix were awesome. It was great to sit on the porch at sunset. We especially liked that we could walk to so many restaurants and shops (being central to downtown), and enjoy the waterfront. We were central to alot of other cities and areas to visit. The staff at the Water Street Inn were very nice and helpful.It would be a place we would stay again. Like going to the Caribbean in northern michigan.The staff is also excellent. Out of all our rentals that we've had so far we loved this the best and plan to go back. The waves hitting shore are tranquil and relaxing. It was special as it is every year. I have been coming to Charlevoix for over 60 years and staying at Water Street for 18 years. this was a very enjoyable stay with a beautiful view, a clean & comfortable space and an easy check in and check out process. We were so impressed with our condo! Very clean, updated, and the beach was perfect! Private, comfortable and like home. This truly was a great choice for us. We live on the water (Lake Huron) and so like to stay as close to the water when we travel. Couldn't have asked for a more perfect spot for us. Lots of room to relax. Staff, front desk and room care were very interested in how we were enjoying ourselves. Everyone was great. Thanks for the comfort of home! Great location, if it wasn't 30 degrees we would have been on the beach and in the water. Overall good. A little tough finding at night but very clean and priced reasonably.